Getting back to work after a 14 day winter vacation was hard. I loved being home with my family. It was an easy, relaxed, no schedule time. Even my husband was home except for 3 of the 14 days. We hibernate like no one else I know and I feel best when we are all together. We ended the kids school year on the worst possible note. Basically Handsome had an issue on the last day of school and would have been suspended (ISS Room meaning in school suspension). He is in a self contained class and his amazing teacher has a check system for all the different personalities in there. Every day, everyone starts out with the same amount of check marks (I think there are 6). These are chances to do the right thing and I think 6 is being generous. There are specific rules that were created and are posted right next to their checks on a huge board! Handsome lost one check and he couldn't un-focus from this so he proceed to lose every check over a very short period. His teacher is amazing and tried everything to get him to make the right choice including not taking his recess away if he just came back to class and did the right thing. Yeah, no he couldn't do that and was brought down to the guidance counselors office. He was the only administrator there at the moment since we were close to ending the day right before a winter break. He did everything as well to try and get Handsome to chill, stop carrying on and stop crying. This didn't work so he was escorted to the office to sit for the reminding 1/2 hour of the day. Handsome is very fortunate to have people who understand he is Spectrum and that his disabilities sometimes make it impossible for him to hear others opinions and accept it. If it is against my Handsome's way of thinking which is very black/white. He is very literal and cannot see outside the lines, has difficulties with infrencing, and making predictions or drawing conclusions or reading body language. We ended the school day with a very very long meeting (his teachers suggestion). Have I mentioned how awesome he is. The day before a break, he stayed after school in a almost 2 hour meeting to help Handsome understand and to make a fresh start when school returned. We did everything to help him understand. He was belligerent, disrespectful, unafraid that three adults (the school psychiatrist was there) were trying to talk to him. No one yelled, everyone spoke but he just couldn't do it. He was sure we were all wrong. That his name shouldn't even be on the board and that we are all wasting his time. Finally his dad called, we put him on speaker phone and we all spoke to him. The meeting eventually ended, nothing was really figured out but he finally agreed and made a deal with his teacher after I took Goddess (who was so patient) to the restroom. We spoke it about things a few times over break. 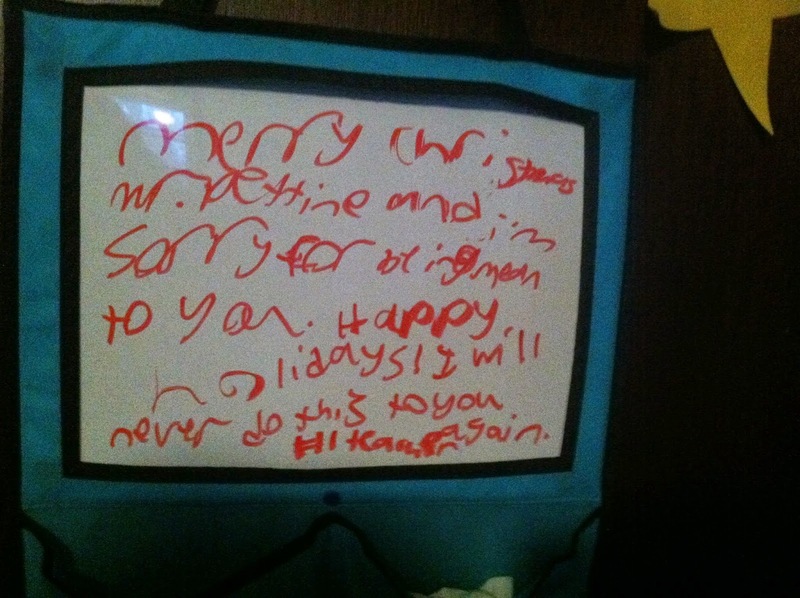 He has a dry erase board on his door for notes from family that he kept writing notes to his teacher on. Merry Christmas Mr. Dehine and I am sorry for being mean to you. Happy holidays. I will never do this to you again and another read I hope you had a good Christmas Mr. Dehine. Hopefully we start the year off much better then we ended!